So, the day after my birthday (and subsequent party), I had my very first jury examination! For those of you unfamiliar with the term outside of the American Judicial System, a jury is like a performance exam. Music students have to demonstrate their progress by dressing up like they would at a recital and performing a few diverse pieces of music for a select group of faculty higher-ups. There were three people in my jury besides me and my awesome accompanist: The Extension Division department head, my teacher, and the teacher of the saxophone player who went ahead of me. He Shall Feed His Flock from Handel’s Messiah. I was attempting, in my choice of pieces, to be diverse. That’s why I chose the Handel. It’s not a great piece for the instrument, but I chose it because I was familiar with it, it was Baroque, and I’d never heard anyone play it on the theremin. I got to choose which piece to play first and I played Vocalise. It went really well although I could have turned my amp up a bit more to get a wider range of dynamics. On the EPro I used the most muted timbre for this piece — the one to the far left of the dial. It made the high notes less screechy. I didn’t know they were going to be writing during the piece, but as soon as I got used to that, everything was fine. When I had finished the Vocalise, they all complimented me, saying that the sound was beautiful and haunting. The next piece was chosen for me by the jury panel. I was crossing my fingers for the Faure. Of course they chose the Handel. I changed the timbre to produce a more brassy sound. It went well. I probably added more crescendos than Handel had originally intended for an Oratorio, but it would have been pretty dull without them. Again, they complimented me and told me that it sounded like a voice! Hooray! A few days later, in the hall, the Extension Division department chair saw me in the hall. I got my evaluation back yesterday. It was in the key of A.
I have completely forgotten how to update blogs. Surprised was I when Eliza blog-tagged me! 1.) I’m sorry, but I just don’t like Laura Linney. 2.) My stomach can’t handle oranges but other citrus fruits don’t bother it in the slightest. 3.) If I don’t have a stick of chapstick on my person at all times, I feel completely unbalanced. 4.) In 1999, when Santana and Rob Thomas most brilliantly joined forces to release their artistic masterpiece, “Smooth,” I simply could not get enough of it. 5.) There are six lamps in my house. 6.) If rice gets too expensive to have around the house, I will be fine with that. I don’t usually keep rice around the house anyway! Pretty cute, all of them. The only 20th century piece that I am working on is Ravel’s Habanera. MORE! I BEG OF YOU! If anyone has any suggestions of 20th century pieces (for any monotonal instrument including voice) please do not hesitate to drop them off at the next coast guard station. If you could also include where the HECK to find these pieces, that would be most helpful. Out here in the ocean, one can only forgo practicing for a week or so while listening to 20-second itunes samples, scouring wikipedia, and googling “easy 20th century sonatas.” I’m at a loss. Please help. Oh, but please spare me the microtones and the freaky messy nonsense. I’m not ready to give up on melody quite yet. Hopefully this message reaches you intact. 1.) Starting back to school in January. REALLY ready to get back to work. 2.) In lieu of the fact that my freedom of speech was REVOKED last semester on account of shady school policy, I have decided to skirt around the subject by changing all references to the name my college to ” [A Paradigm of Higher Learning Specializing in Classical Music Education]” and un-protect all formerly password-protected posts. In other words, you can read all my posts now and I will resume my commentary as soon as the spring semester has commenced. I try not to be too personal on this thing, but I guess most people have read the first few entries where I mentioned that my mother was struggling with stomach cancer. Unfotunately, last week, we let her go. In time, I hope to return to posting and playing and composing. I have taken a leave of absence from school for the semester. Thanks to all of you who have offered words of kindness and encouragement. I didn’t sleep much on Friday night, due, probably to jet lag and excitement. I bet that’s why I woke up with a terrible headcold. There are not a lot of things that are more irritating than the swollen glands, slight scratchy throat, and congestion headache that come on the first day of a cold. Uggghh. The first event Saturday morning, after breakfast, was a demonstration from several very interesting theremin engineers/inventors and an explanation of effects from from some experimental/avant-guard thereminists. First, Jake Rothman showed us his theremins. He makes three theremins: the Pocket theremin, the Eclipse theremin, and the Elysian theremin. The pocket theremin is cute and funny, and kind-of a novelty item, and you really concentrate, you will be able to make a tune. The Eclipse is slightly larger and it’s much easier to play. The Elysian is really quite nice, with a lovely sound. It’s a “regular sized” theremin with both volume and pitch controllers, but the volume controller is in the form of a metal plate and it’s on the top of the theremin box, and it’s backwards. The closer you get to the plate, the louder the sound. Jake explained that this was because he has a background in guitar and piano and he wanted the theremin to be more hands-on. It makes a cool sound when you actually touch the metal plate. Also included in the Elysium is a ring modulation button. He said that he handn’t quite figure out what it can be used for, other than to make crazy mixed-up sounds, which it does quite effectively. Jake was enthusiastic and entertaining with all of his demonstrations, a great guy! Next up was another Theremin maker, (Tony Bassett?? ), who had made some really fascinating instrument inventions. This colorful man was clearly a technical genius. Most of his instruments were really interesting looking and had a multitude of built-in effects. While they didn’t make the typical theremin sound, his instruments took the principle of the theremin and expanded them into mutli-functional and creative pieces of art. He had a theremin/controller that was clear glass and another one that performed many of the same functions, but the controls were disguised as organ stops. His midi controlled instruments were equally as mind-boggling. He made a keyboard-looking midi instrument for kids whereupon they could control the sound via a flashlight. Ridiculously cool. I think Jon Bernhhardt was next. He demostrated how to make interesting sounds with Moogerfooger effects. My favorite was the MuRF. Jon somehow made his theremin sound like a human voice saying “yeah yeah yeah.” YEAH! Next up was Wilco Botermans and his Croix Sonore. Wilco’s Wife Jessica gave us a history lesson about the Croix Sonore. Visually stunning, the instrument has a fascninating history. Unfortunately, included in that history is a lasting reputation for technical difficulties. Wilco’s Croix Sonore decided to comply with its own history, so it didn’t work. I believe that it does work, though. I BELIEVE IT! Sarah Angliss (aka SpaceDogUK) had technical difficulties as well, so her demonstration was postponed until later. Next up was a fellow (name?) who had a refurbished antique RCA theremin. He had an old fashioned speaker as well! Really cool, really hard to play, it has a low register and a range of about two very unlinear octaves. Nevertheless it was a real treat to play it. Next, Wilco demonstrated his effects including his controller glove. I had seen his demonstration at Ethermusic 2005. It’s really fantastic. Basically, he controls Moogerfooger effects with his left hand using an expertly-wired glove. All of these technically minded people are truly an inspiration to me. I am really partial to the raw sound of the theremin. Lately, though, I’ve been trying to create music that I can play solo but I didn’t want to have to bring backing tracks with me. It’s now clear to me that this can be done with effects. I can just lay down the background live and play along. I haven’t been out of the country since 2000. 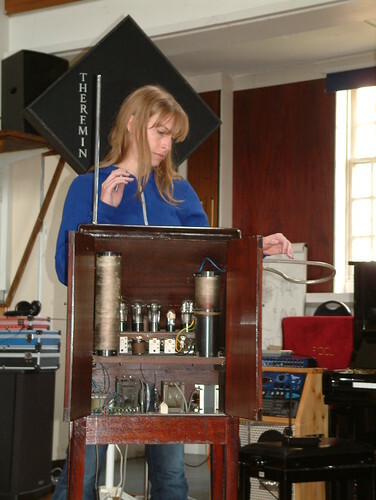 So what better reason to break this US-streak than to go to Hands Off 2007, A Theremin Symposium. 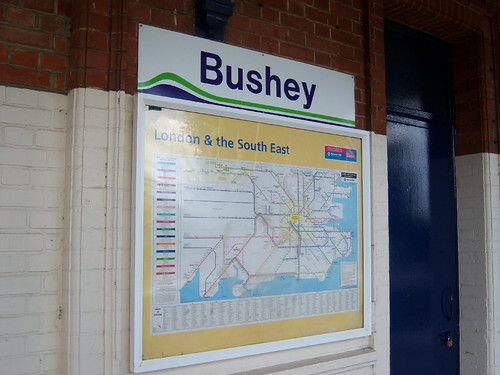 The symposium was held in Bushey, Hertfordshire, about 45 minutes northwest of London. 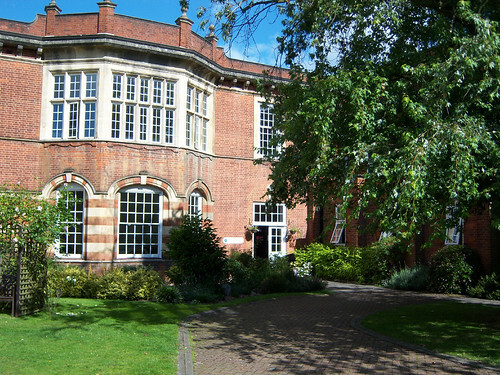 I figured out how to get there using busses and trains and eventually, my own two feet, which took me on a 20-minute walk through the lovely countryside, theremin in tow, to The Purcell School. I arrived at around 1:15pm and found that I was one of the first to arrive. I chatted with the few others that were there including the Symposium Officiant, Gordon, and watched a bit of magic from a fellow thereminist named Mark, including a trick where he transformed a normal fork into a mangled piece of art right before my eyes! By sheer mindpower! Mark not only goes to Theremin Symposiums, he also attends Magic Symposiums! After helping thereminist and sound technician JD unload his sound equipment and greeting the others as they trickled in, I was shown to my room by Maya, Gordon’s wife, who also happens to be a superstar. “It’s not unlike Hogwarts, in’it? !” AGREED. 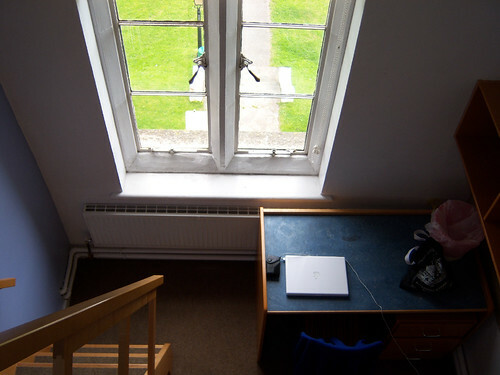 Here’s a view from the lofted bed. I always wanted to go to boarding school. I still wish I had gone to boarding school. All the private dorm rooms double as practice rooms, too. Some even had pianos! FUN! After I got back downstairs, I was called upon to help Maya pick up some items from the store, namely alchohol. As we were leaving the Star Thereminists arrived. Lydia Kavina, Carolina Eyck, Barbara Buchholtz and Charlie Draper all carpooled. Adorable. But Maya several new friends and I went to the Costco. That’s right, I said Costco. Now, I’ve never been to a Costco in the US, but I have been to a Sam’s club. Not much difference, except for the general names of foods. My job was to look for Cheese Biscuits and Cocktail Sticks. We were there for a really long time. Back at the School the attendies trickled in and got settled. I chatted with just about everyone, I think. My jetlag induced in me some kind of fearlessness enfused with giddiness and I found myself rather punch-drunk. Nerdy hilarity was flooding the building but we were all mutually aware of it. I was pleasantly surprised that there were a fair number of my contemporaries there, all doing fascinating things with music and who shared my fascination and respece for the theremin: Coco, Tracy, Kevin, Robert, Christian and others. . . I don’t think I’ve ever been so comfortable in a room full of complete strangers. While we were mingling, the attendies were setting up all of their equipment. There were a number of faschinating instruments in the room as well as synths and effects the likes of which I have never seen. Thus began the sound of the Symposium. Throughout the weekend, there was a constant drone of theremin in the background. So much that there were reports of waking up in the middle of the night to hear it still wailing on. Maybe someone was playing at 4am in the dorms, but it’s most likely that all of our ears had acclimated to our environment. All meals were served in an adorable cafeteria. My fears of cafeteria-cliques faded as there was a consistent dinnertime mingling of thereminists. Only once did things get a little tense as I almost dropped my tray on Barbara Buchholz as I got up from my cafeteria bench. The disaster was averted, thankfully, and I avoided her for the rest of the evening. After dinner, the magician Mark provided the entertainment in the form of a show during which he narrowly avoided impaling himself with a large nail. Later, announcements were made and there was a wine and beer party, providing a pleasant forground to the constant “woooooooooo” background. As things became winefuzzy, I remember daring Jon Bernhardt to stand on a table and turn a crank that we all supposed closed the curtains. Instead, it lowered a microphone. 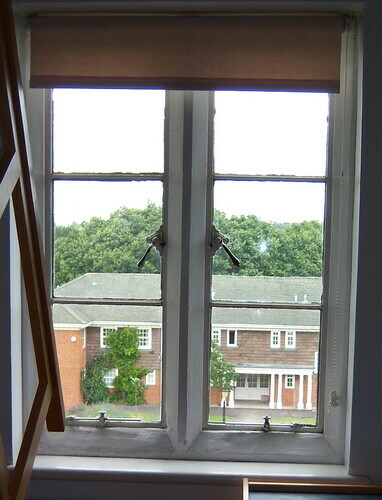 The curtains were then closed by a fellow named Robert, who found the way to the balcony and the curtain pulley. After that and another glass of wine, I made an embarrising but telling statement about how I found European thereminists to be INFINITELY less creepy than American thereminists. That’s just the way it is. Finally, I think we coined the term “Theremin Face” that evening. Everyone has one. I know this because I have photographs. Well, I’ve been saving myself from the computer hell that is a crappy pc laptop and I have entered the world of the glorious MacBook. In other words, I got a new computer and so what if I’m obsessed with it!! I’m gonna go so far as to say I love this adorable little machine in the same way I love my cat. It’s just different than all the others. It’s like it was made for me. I suffered through several other cats – I mean computers – and I finally feel as if one loves me back. I have a hunch that it has something to do with the fact that I just turned 30. Was I supposed to tell you all that? Who cares. ~I performed the Rach Vocalise at the chamber music recital. ~I got all A’s except for in Dictation because it’s hard and it blows my mind and in chamber music for obvious reasons. My goal for the summer is to create a set-full of cool, hip, fresh traxx on Garageband so that I can get out there and start “hawking my [theremin]wares” on the mean streets/clubs of NYC. So, periodically, I will post new music in the music section of this blog. See it? Yeah right there at the top right of your screen. I already have one new song up and a new recording of Vocalise. Check it out, please! This evening, I was informed that it was against school policy to have a blog. I’m currently validating this information. I’ll continue to update you all here regarding theremin related activites outside of school . . .
Hi friends – So, a year ago, I recorded for a short film called Dear Lemon Lima directed by the very awesome and talented (Stickerbook fan) Suzi Yoonessi. It’s in the Tribeca Film Festival this year! To be honest with you, I have no idea if what I recorded is still in the film. It’s still important to us because one of the characters in the film, Nothing, plays a Moog Etherwave Standard. A lonely girl with a vivid imagination struggles to plant seeds of love after her narcissistic sweetheart breaks her heart. But a chance meeting with “angel-headed dorks” Hercules and Nothing enables her to overcome her heartbreak on a serendipitous summer day. Dear Lemon Lima thrives on the notion that life is a time to celebrate our common traits and differences and inspire kindness and equality in others. If my theremin-ocity is still in the film, it will be delightful and thrilling to see and hear it all in a real NYC movie theatre. Yikes! Completely Off-Topic? I guess. . .
Let’s get back to BIZ-NIZ! Leave of Absence. . .